Botelet is nestled in a valley in South East Cornwall offering peace and tranquility in a rural setting. There is much to do on your doorstep - step out across the fields at Botelet exploring the 300 acres of countryside, walk up to Bury Down iron age hill fort, or follow the paths through the deciduous woodland. For runners, there are a number of great circular routes along pretty, quiet country lanes. In summer set up a deck chair to catch the sun in a private corner of the gardens, and in winter curl up by the woodburner, while you get lost in a good book. Botelet is an idyllic setting for family holidays, children will love running through the fields, playing on the trampoline in the orchard behind Manor Cottage, dipping their toes in the stream that runs through the woodland, and are very welcome to help feed our chickens and collect eggs. Relax in our therapy room and book a nourishing massage during your stay, advance booking highly recommended. We also have a range of creative and wellbeing courses take place at Botelet throughout the year including retreats (one-day and residential), Introduction to Massage Courses, Family Head Massage Workshops, Meditation Classes, Family Sketch Clubs, Children’s Yoga Sessions and more. Check the Events page of our website for a list of upcoming dates, or contact us to arrange a private session. Out and about, we surrounded by fantastic beaches - long stretches of sandy surfing beaches on the North coast (from 35 mins drive), and quiet coves for swimming and rock pooling on our doorstep (from 15 mins drive). 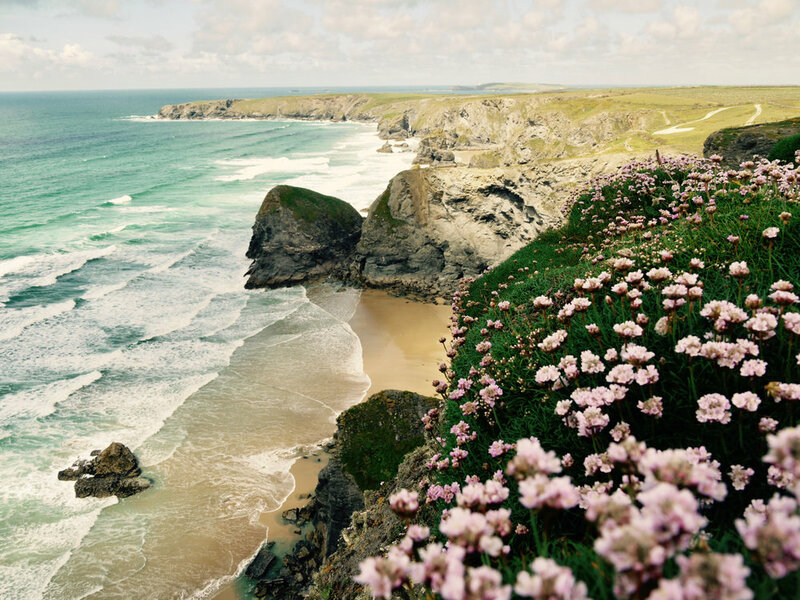 There is a coast path that circulates Cornwall - a great focal point for a day’s walking. The National Trust has a number of historic houses and gardens within half an hour of Botelet, and there are no shortage of shore- and water-based activities as you explore Cornwall. Whilst staying at Botelet, we provide you with local information to help you plan your stay including suggestions for local towns and villages to visit, cafés, restaurants, farmer’s markets and community events taking place nearby. We are always happy to help with local recommendations.